Have you ever wondered what kind of women rich single men like? Now you don’t need to keep guessing anymore, because we have already figured it out! When so many fashion magazines tell you boyish outfits are trendy, throw them in the bin now. Rich men secretly like women who wear lace, pearls and flowers. They want to see you wear patterns such as butterflies and love hearts. They want to see you wear colors such as pink and red. These can’t exist on men! In other words, they want to see you being a real woman. It is true that all men like good-looking women. But in the long term, your intelligence will keep your rich man! That means a rich man will be impressed if he hears something really smart from a pretty woman, because in this day and age, these two qualities rarely come together: fascinating beauty and phenomenal intelligence. However, this doesn’t mean you need to go to Harvard or Yale in order to get a rich man. But it does mean you should keep educating yourself either by reading more books or learning some other practical skills in your spare time. Once you have understood the importance of lifelong learning, rich men will cherish you even more. I still remember that a few years ago, a rich single man said to me, "I like talking to you, because you make me so relaxed. You know what, many modern women only get into a competitive mode once they start talking these days, and that only makes me want to leave the conversation." So now you’ve got the gist: Rich men don’t like competitive women. They only want to be admired! This is because when a rich man is having a conversation with another man, they are often competing with each other. 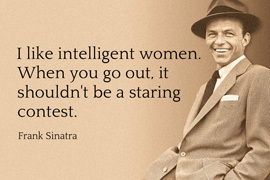 So rich men are sick and tired of that already – they don’t expect their beautiful women to compete with them at home!